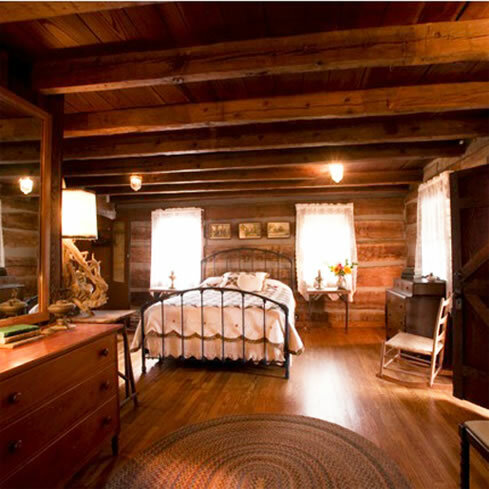 This spacious room with its' massive 200 year old logs and solid chestnut walls and ceilings embodies the feeling of its' era dating back to the early 1800's. This room has a private bathroom with an antique claw-foot tub, an oak dresser converted to a vanity sink, and an old time pull chain toilet, furthering this sense of a time bygone. The master suite opens onto a sleeping porch with a private sitting area. In the warmer months one can slumber surrounded by the pleasant sounds of nature in the comfort of a 3/4 antique cast-iron bed. "I slept like a baby every night"